is working on "Why and How INSPIRE-UNSDI should work together? " 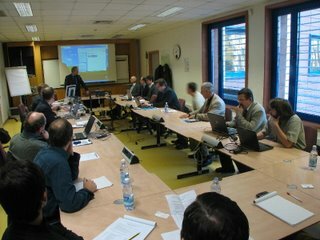 It is a great honour for the Hungarian Spatial Data Interest Community that the approach of the Hungarian UN SDI Coordination Office (HUCO) was proposed to be adopted/used as example at the Meeting of the Global Partner Conference of UNGIWG on SDI will be held at ESA-ESRIN in Frascati in Early March next year. It was one of the findings of the recent consultation meeting arranged by FAO and DG JRC and hosted by the Unit Spatial Data Infrastructures at the IES of DG Joint Research Centre (JRC) of the European Commission. The invited participants on the UN side include GeoNetworks specialist Jeroen Ticheler of FAO, as well as representatives of the Dutch UNSDI Coordination Office represented by Jan Cees Vanema of NLR and Patrick E.Van Laake of ITC, the Czech UNSDI Coordination Office represented by Karel Charvat of SCC and an expert from the Olomutz University, finally the Hungarian UNSDI Coordination Office represented by Gabor Remetey-Fülöpp of HUNAGI. On Inspire side the following experts were invited: Martin Lenk, Head of IMAGI (the German Federal Geographic Data Committee) , Daniel Holweg, Project Manager of the European project Humboldt, as well as Spanish expert of the gvSIG Salvador Bayarri Romar of IVeR and José Ángel Alonso Jiménez of DG IGN in Madrid.